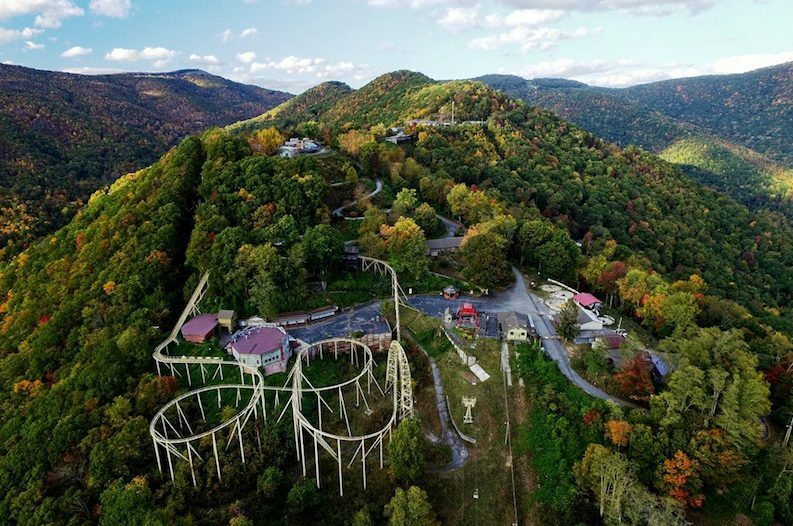 The once-popular western North Carolina amusement park, "Ghost Town in the Sky" has been closed since the early 2000s. But thanks to new owners, Ghost Town Adventures (a new company), the park is set to reopen in April 2019. Sitting at 4,600 ft. elevation, the park has been in existence since 1961. R.B. Coburn built the Wild West-themed amusement park on Buck Mountain for $1 million. During its peak seasons, the western town welcomed around 500,000 guests. These guests moved quickly through the park as the chairlift impressively transported 1,200 people per hour. The ghost town property showcases 40 buildings on four different levels. The theme park breaks up the "towns" into different themes. Themes include the Indian Village, Mountain Town, and a Mining Town. The scenic Old West village is still fully intact today and includes the original furnishings. Hopefully, the upgrades maintain all of the original charms of the wild west theme. The Ghost Town in the Sky included thrilling rides such as the Red Devil Cliffhanger roller coaster, a tilt-a-whirl, a scrambler, bumper cars, a merry-go-round and more. New rides were added regularly in the 1990s. But when the older rides began breaking down, Coburn ended up selling the property back in 2002 after guests became stuck on the chairlift. Since then, the park has changed hands and endured multiple other problems. Lamar Berry, chairman, and CEO of Ghost Town Adventures purchased the property from the previous owner, Alaska Presley. After spending years trying to revitalize the Maggie Valley property, Presley was unable to continue her upgrades. But she is helping the new owners with their vision to revamp the beloved park. During her tenure as owner, she implemented several positive changes, including rebranding the theme park to Appalachian Village. The Charlotte Reporter says that new executives of the park include Valerie and Spencer Oberle, who previously worked for Disney. Spencer will act as president of Ghost Town in the Sky and Valerie Oberle as executive vice president of brand and people management. According to The Mountaineer, Berry plans on adding a Western Shootout show to the old west town in addition to a vintage church that will be available for weddings. With many attractions in close proximity such as Asheville, the Blue Ridge Parkway, Great Smoky Mountain National Park and the Wheels Through Time Museum, this ghost town village is a prime piece of real estate. It's exciting to see what all of the upgrades will bring!